A boxed notice in the January 17, 2012 edition of the Martinez News-Gazette community calendar caught my eye. "The Grange is returning to Martinez. A grassroots, agricultural based organization that began in 1867, the Grange is older than the Statue of Liberty and is open to all members of the family. The organization's motto is 'in essentials, unity; in non-essentials, liberty; in all things, charity.'" Since I knew the original Grange chapter in Martinez had been founded sometime in the early days of the town and that there had been a Grange here when I arrived in the early 1960s, my curiosity was piqued. I called the phone number in the item and talked to Karen Luckman who along with Lori Delfino is organizing what is at least the third Grange chapter in order to provide community and agricultural related service opportunities not just for local youngsters but for entire families. But Karen didn't know anything about its history in Martinez and encouraged me to find out and tell her more. As I expected, the search for information began at the Contra Costa County History Center on Main Street. Knowing that John Muir's father-in-law, Dr. John Strentzel, had been one of the founders and most active leaders of the Grange here, I headed for his file and struck local history gold. The National Grange of the Patrons of Husbandry was established after the Civil War with the purpose of healing the divisions from the war, helping farmers, particularly in the South to improve their techniques and to break down the isolation felt by so many farm families by providing common ground, social activities and purpose. It was also the first national organization in which women were completely equal to men, a circumstance that led directly to the successful woman's suffrage vote in California in 1911. It was farmers from throughout the state who provided the narrow victory. In those days, agriculture was the most significant economic activity and most Americans lived on farms or small towns. Grange halls were constructed in small towns across the country and often, as in Martinez, the halls were "the center of their community, providing opportunities, culture and education, entertainment, emergency shelter, and a meeting place where new friends are made and old friend cherished." Indeed the first performance of the Martinez Opera Company was held in the Granger Hall located on the northwest corner of Mills and Howard Streets known to present day residents as Estudillo Street and Marina Vista. The Grange has also actively advocated on behalf of farmers against unfair economic conditions affecting the farm community. Never was this more potent than in the early 1870s when the Alhambra Grange was founded, in part to protect Contra Costa farmers from exploitation by the banks and the railroads. In fact, reading through the files, the comparison of farmers then to today's 99 % movement was very easy to make for many of the same reasons. The Panic of 1873 (now it would be called a "Crash"), begun in part by banks and businessmen finagling with the price of silver, caused a nation-wide depression in which farmers soon found themselves completely at the mercy of the banks they depended on for loans of the necessary funds to plant and harvest crops. Also holding farmers hostage were the railroads expanding across the country to carry the harvest to market usually with no competition. It appeared that both were trying to recover from the crash on the backs of farmers. In Contra Costa County, it was grain and shipping brokers in San Francisco who kept inland wheat farmers from making a fair return on their labor by contracting with every ship coming into the busy port at a fixed price per ton which was offered by ship captains to local farmers as a take it or leave it proposition. There was even a monopoly on grain sacks which farmers could only obtain for a sky-high price. Dr. John Strentzel, a Polish immigrant who came to California by way of Texas, moved his family wife Louisiana and children Louise (Louie) and John here in 1853. Buying land in Alhambra Valley, Strentzel practiced medicine here briefly while focusing on agriculture and horticulture, his real interest. Buying land at every opportunity Strentzel soon became one of the new town's wealthiest and most respected citizens, in large part because of his role in the Alhambra Grange which he helped found on September 12, 1874. Strentzel was elected Master. Other familiar early Martinez figures to become officers included W. Frazer, secretary; H. Raap, overseer; B. R. Holliday, lecturer; J. McHarry, Chaplain; J. C. McHarry, treasurer; E. Barber, Steward; L. Smith, Assistant Steward; J. Stewart, Gatekeeper; Mrs. A. Boss, Ceres; Mrs. H. Rapp, Pomona; and Miss Louise Strentzel, Flora. If the names sound familiar, think of how many streets they appear on downtown and in Franklin Canyon and Alhambra Valley. The greatest achievement of the Alhambra Grange and its sister Granges statewide was to break the back of the monopolistic grain shipping set-up and reduce dependency on unfriendly banks by forming its own warehouse in Martinez and a bank in San Francisco willing to deal fairly with them. 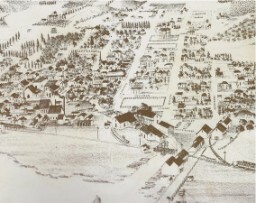 In 1875 Strentzel invited Grangers from Walnut Creek, Danville, Antioch and several other communities to meet in Walnut Creek to discuss establishing what became the Grangers' Warehousing and Business Association of Contra Costa County. Strentzel was named president. According to writer Scott Akers the goal, in addition to making a profit, was to provide implements, money and other services a grain farmer needed with the interest of the farmer paramount unlike the other commission merchant offered. Honesty was high among the moral virtue of Grangers and was to be of extreme importance in every grain transaction. In 1876, construction of a wharf and a warehouse was begun on land at the end of Berellessa and Smith Streets so ships could load up and sail to San Francisco and beyond directly. Although Port Costa under businessman George McNear became the leader in profits from grain transshipping, the Grangers did quite well from May, 1879 to May, 1880, they took in about eight million pounds of grain. It grew to 50 million pounds (25,000 tons) by 1884. The Alhambra Grange fulfilled the movement's goal of providing agricultural education for youth as well as adults, family activities and community involvement partly through Strentzel's loan of the family piano which his daughter Louie played during meeting song fests. The meeting hall was located on the northwest corner of Mills and Howard Streets, known to us now as Estudillo Street and Marina Vista. It also served as a community gathering place for special events such as performances of the Martinez Opera Company California's first professional opera company. One challenge of the location even though it was approximately 5 blocks from the wharf was provided by winter rain storms. The mud would be so thick that patrons' overshoes would sink beneath the surface as they approached the hall for the performance. Although Port Costa under businessman George McNear became the leader in profits from grain transshipping, the Contra Costa Grangers did quite well from May, 1879 to May, 1880, they took in about eight million pounds of grain. It grew to 50 million pounds (25,000 tons) by 1884. I haven't been able to find out yet when the Alhambra Grange closed but in 1949 a new Martinez Grange was founded as a sub-chapter under the larger Pomona Grange in Concord. By then there was no longer a Granger's Hall so the chapter met in schools and church basements and the Camp Fire building and held some of its social activities on local ranches such as Manuel Trebino's on Reliez Valley Road. Manual was an early master of the Martinez group and later headed the Pomona Grange and was a representative to the State Grange and a statewide leader. His grandson, Rich Trebino, remembers accompanying his grandparents to the state grange conference in Hollister and helping Manuel set up the Grange booth at the County Fair. "It was lots of fun," he recalled adding that there were lots of great activities for children. Rich thinks Martinez Grange closed sometime in the late 60s but can't remember for sure. Today's chapter, Martinez Grange No. 853, is one of 207 chapters with 10,000 members across the state. It meets at 6:30 p.m. on the third Wednesday of each month at the Mountain View Improvement Association, 600 Palm Avenue, Martinez For more information, call 925-935-2875 or email martinezgrange@yahoo.com.